Card Text: Menace (This creature can't be blocked except by two or more creatures.) 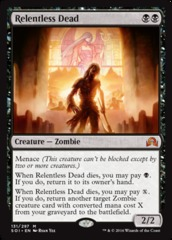 When Relentless Dead dies, you may pay B. If you do, return it to its owner's hand. When Relentless Dead dies, you may pay X. If you do, return another target Zombie creature card with converted mana cost X from your graveyard to the battlefield.